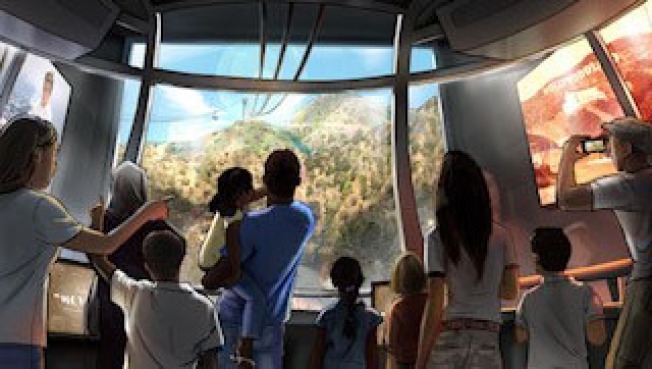 Warner Bros proposed a $100 million aerial tram, coined The Hollywood Skyway, to carry passengers up to the iconic Hollywood sign. The Los Angeles city councilman who represents the Hollywood Hills area remained neutral Tuesday on the idea of an aerial tram to the Hollywood Sign, a day after Warner Bros. came forward with a proposal to fund one at a cost of $100 million. The city council is still assessing the report and Councilman David Ryu has not endorsed any of the proposals in the report from Dixon Resources Unlimited while the council is analyzing them. "Councilmember Ryu is committed to a solution-driven process to the safety, mobility and access issues around the Hollywood Sign," Montemayor said. "Upon return from the City Council recess, city officials will continue to discuss the feasibility of various proposed solutions, including transportation proposals such as a shuttle or aerial tram with the full participation of community stakeholders." The Dixon study was commissioned by the city council at Ryu's suggestion as a way to find solutions to the increased problem in recent years of people driving or hiking to the Hollywood Sign since the advent of traffic applications such as Waze have made it much easier to get close to the tourist attraction. Warner Bros. proposed installing an aerial tram at a parking structure next to the company's Burbank lot that would take visitors on a six-minute ride more than one mile up the back of Mt. Lee to a new visitors center near the sign, with pathways to a viewing area, the Los Angeles Times reported. It's the second major proposal for a privately funded aerial tram or gondola in the Los Angeles area. A company owned by former Dodgers owner Frank McCourt recently proposed building one from Union Station to the parking lot of Dodger Stadium. That proposal was advanced to a second stage of consideration in June by Metro, the county transit agency.